Visual Studio includes an Android SDK Manager that you use to download Android SDK tools, platforms, and other components that you need for developing Xamarin.Android apps. 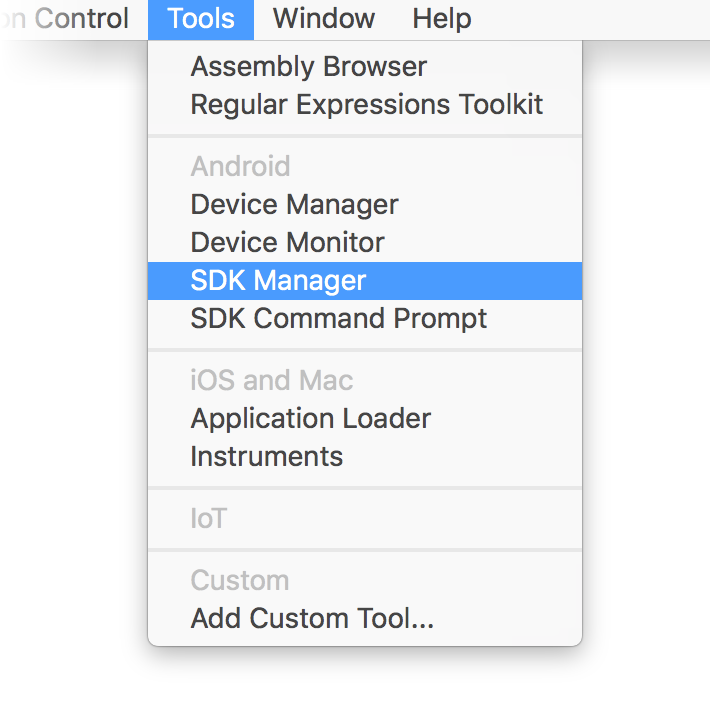 This guide explains how to use the Xamarin Android SDK Manager in Visual Studio and Visual Studio for Mac. This guide applies to Visual Studio 2019, Visual Studio 2017, and Visual Studio for Mac. 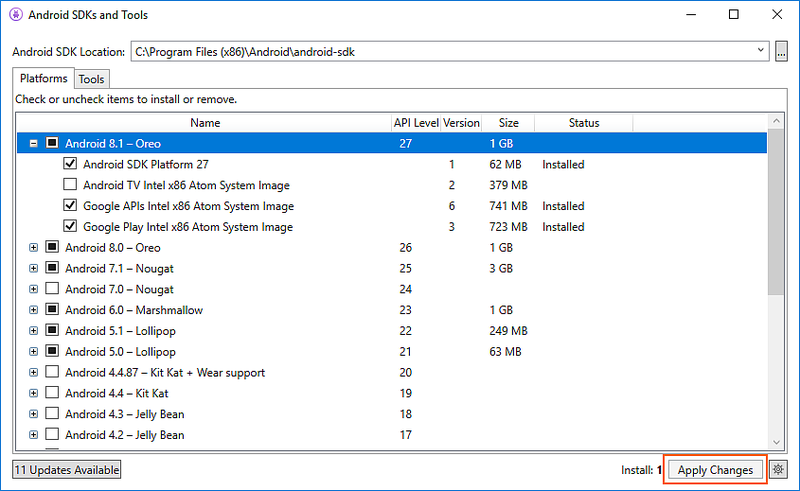 The Xamarin Android SDK Manager (installed as part of the Mobile development with .NET workload) helps you download the latest Android components that you need for developing your Xamarin.Android app. 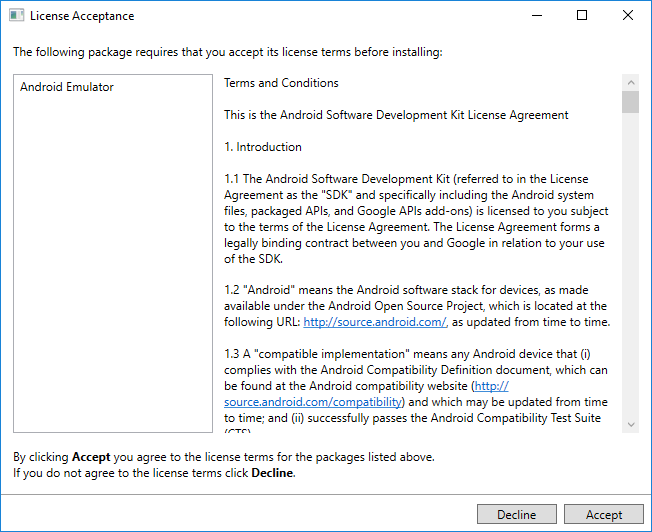 It replaces Google's standalone SDK Manager, which has been deprecated. OR Visual Studio 2017 (Community, Professional, or Enterprise edition). Visual Studio 2017 version 15.7 or later is required. Visual Studio Tools for Xamarin version 4.10.0 or later (installed as part of the Mobile development with .NET workload). By default, Xamarin.Android uses JDK 8, which is required if you are developing for API level 24 or greater (JDK 8 also supports API levels earlier than 24). You can continue to use JDK 7 if you are developing specifically for API level 23 or earlier. If you are using Visual Studio 15.8 Preview 5 or later, you can try using Microsoft's Mobile OpenJDK Distribution (currently in preview) rather than JDK 8. 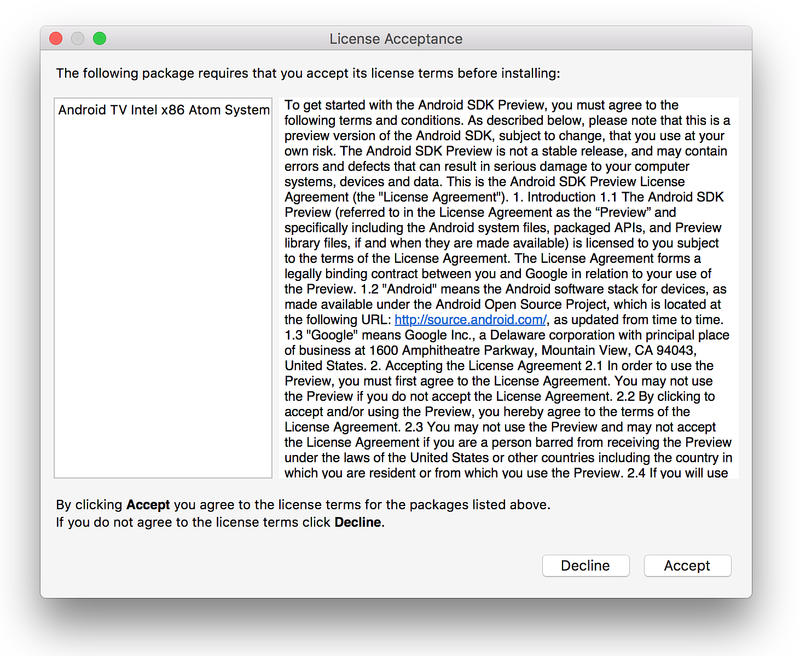 The Android SDKs and Tools screen is described in more detail in the following sections. 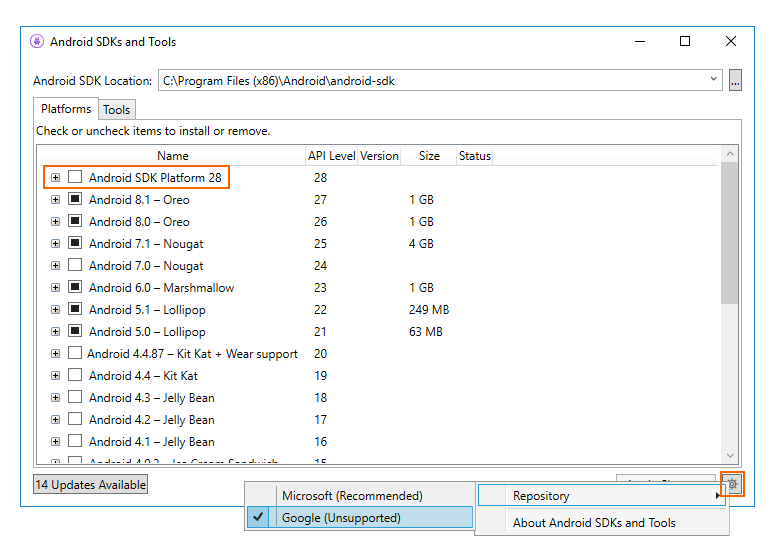 The Android SDK Manager was unable to locate the Android SDK. 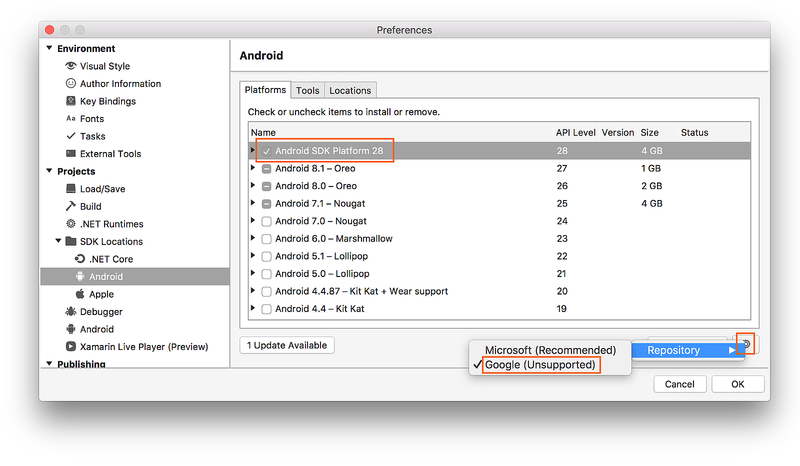 You have installed the Android SDK in a alternate (non-default) location. 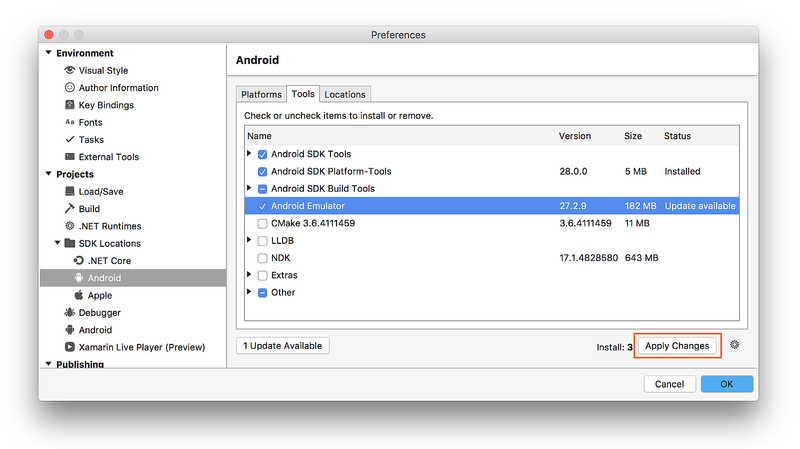 When you click OK, the SDK Manager will manage the Android SDK that is installed at the selected location. The Tools tab displays a list of tools and extras. 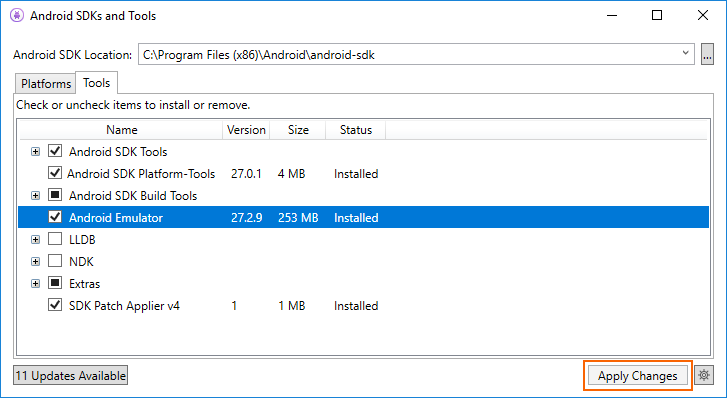 Use this tab to install the Android SDK tools, platform tools, and build tools. Also, you can install the Android Emulator, the low-level debugger (LLDB), the NDK, HAXM acceleration, and Google Play libraries. Click Accept if you accept the Terms and Conditions. At the bottom of the window, a progress bar indicates download and installation progress. After the installation completes, the Tools tab will show that the selected tools and extras were installed. 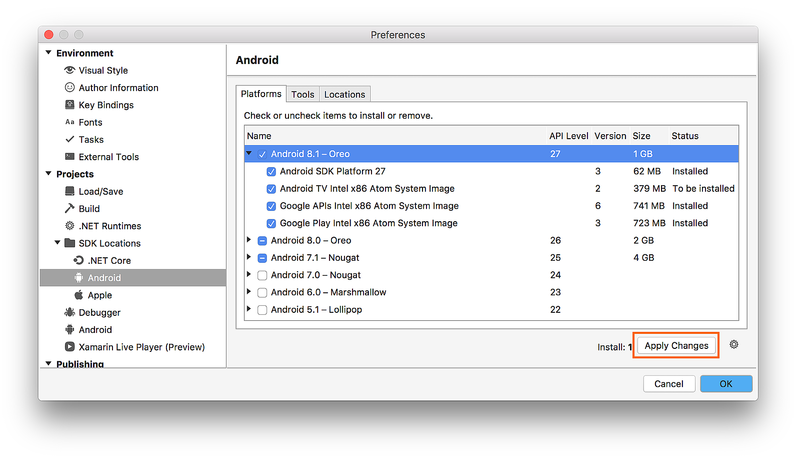 This screen lists the Android version (such as Android 8.0), the code name (Oreo), the API level (such as 26), and the sizes of the components for that platform (such as 1 GB). You use the Platforms tab to install components for the Android API level that you want to target. 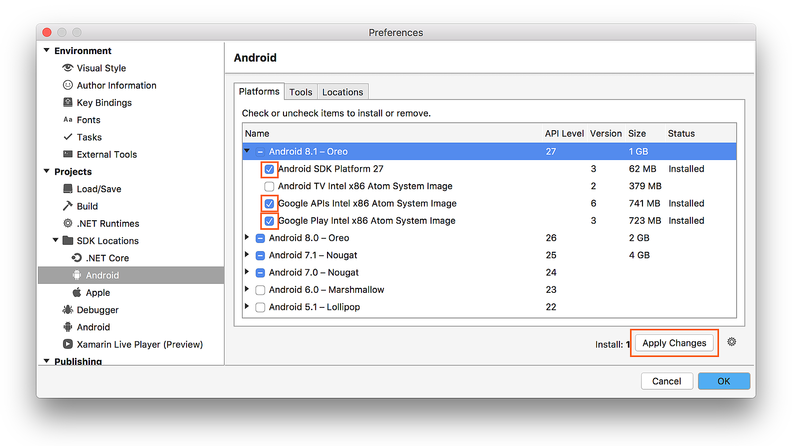 For more information about Android versions and API levels, see Understanding Android API Levels. When all components of a platform are installed, a checkmark appears next to the platform name. If not all components of a platform are installed, the box for that platform is filled. You can expand a platform to see its components (and which components are installed) by clicking the + box to the left of the platform. Click - to unexpand the component listing for a platform. Notice that the number of components to install appears next to the Apply Changes button. After you click the Apply Changes button, you will see the License Acceptance screen as shown earlier. Click Accept if you accept the Terms and Conditions. You may see this dialog more than one time when there are multiple components to install. At the bottom of the window, a progress bar will indicate download and installation progress. When the download and installation process completes (this can take many minutes, depending on how many components need to be downloaded), the added components are marked with a checkmark and listed as Installed. When the Google repository is selected, additional packages may appear in the Platforms tab that were not available previously. (In the above screenshot, Android SDK Platform 28 was added by switching to the Google repository.) Keep in mind that use of the Google repository is unsupported and is therefore not recommended for everyday development. To switch back to the supported repository of platforms and tools, click Microsoft (Recommended). This restores the list of packages and tools to the default selection. Visual Studio for Mac 7.5 (or later). If you are using Visual Studio for Mac 7.7 or later, you can try using Microsoft's Mobile OpenJDK Distribution (currently in preview) rather than JDK 8. 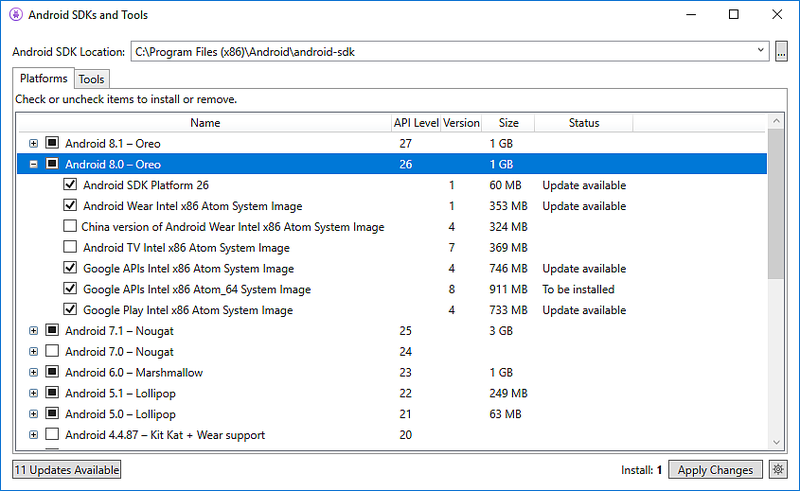 The tabs of the Android SDK Manager are described in the following sections. 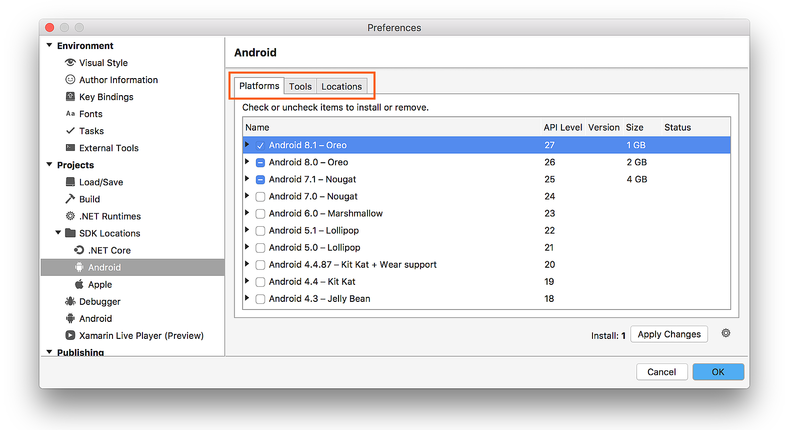 The Locations tab has three settings for configuring the locations of the Android SDK, Android NDK, and the Java SDK (JDK). These locations must be configured correctly before the Platforms and Tools tabs will function properly. Click the Reset to Defaults button to cause the SDK Manager to look for the SDK, NDK, and JDK at their default locations. 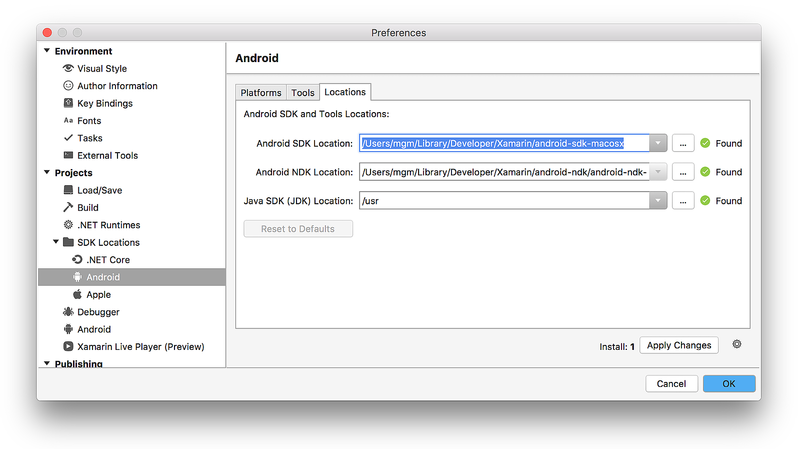 Typically, you use the Locations tab to modify the location of the Android SDK and/or the Java JDK. You do not need to install the NDK to develop Xamarin.Android apps – the NDK is used only when you need to develop parts of your app using native-code languages such as C and C++. 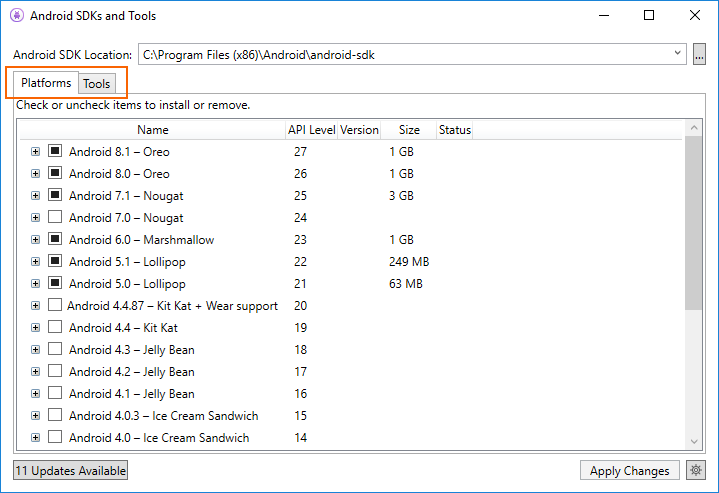 This screen lists the Android version (such as Android 8.1), the code name (Oreo), the API level (such as 27), and the sizes of the components for that platform (such as 1 GB). You use the Platforms tab to install components for the Android API level that you want to target. 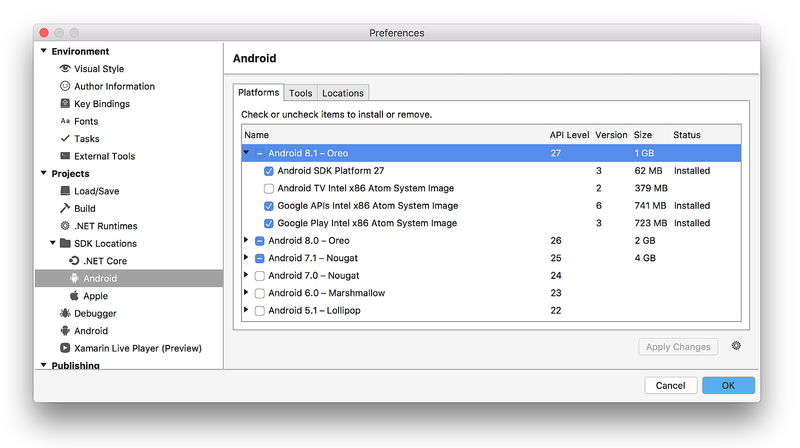 For more information about Android versions and API levels, see Understanding Android API Levels. When all components of a platform are installed, a checkmark appears next to the platform name. If not all components of a platform are installed, the box for that platform is filled. You can expand a platform to see its components (and which components are installed) by clicking the arrow to the left of the platform. Click down arrow to unexpand the component listing for a platform. 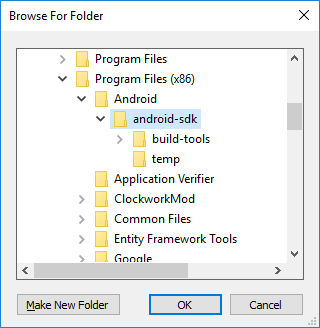 This guide explained how to install and use the Xamarin Android SDK Manager tool in Visual Studio and Visual Studio for Mac.